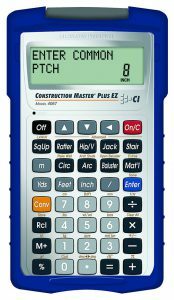 The Construction Master Plus EZ (CMP EZ) is the newest in Calculated Industries' line of award-winning Construction Master Pro construction-math calculators. The big difference between the CMP EZ and the other models is that, in addition to many more built-in calculations, the CMP EZ is a Prompting Construction Master Calculator. The Construction Master Calculator Plus EZ has Basic and Advanced solutions for Rafters (Common, Hip/Valley and Jack) and Stairs. Plus, the built-in materials key gives you instant quantities for everything from drywall and roofing to tiles and pavers. Select the Details tab to see all of the possible solutions. The new and improved large easy to read 2 line display spells it out for you. Select a job such as Stairs by pressing the STAIRS key, enter the known values when asked and solve! It's that EZ. Select the CONV key then choose your job to access new advanced functions to help you with your unusual construction problems for Rafters, Hip/Valley, Jack and Stairs. Accurately estimate the materials you will need for every job - down to the number and size of nails. Press MAT'L key and choose Roofing, Studs, Tile, Blocks, Drywall, Fencing, Footing or Pavers, enter known values and solve! Rugged, shock, moisture and dust-resistant Armadillo Gear Case. As well as one 3-volt (CR2025) battery and Full One-Year Limited Warranty. Comprehensive printed user's guide with examples, U.S. Mode and Metric Mode Tables, and easy to follow charts. Mini user's guide fits into pocket on the back of the calculator, so it's always with you. Comes with English version, and Spanish version is available online. Located on the inside cover of the Armadillo Gear Case, this provides a quick snapshot of examples including solving for basic rafter, clearing the memory, linear and square entry conversions. 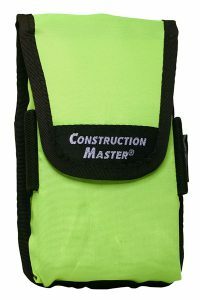 A very well thought out construction master calculator that can handle all types of construction math. Other reviewers mentioned some missing functions but I have not experienced that. It will do the reverse conversions. I have tried more than a few construction calculators, iPhone and iPad apps, but this one is the best one of all to me. The calculations are really set up in a simple, easy to follow manner, and I couldn't be happier with it. I have owned the the project calc plus for a long time, and I figured that was about as good as it gets. Some of the other more advanced ones might be great for some people, but I could never remember any of the formulas that you would need in order to accomplish anything. Just having this calculator to figure out the mitre and bevel angles for cutting crown mouldings more than pays for itself in one job, the savings coming from not wasting any material. It also comes in a nice protective case which I really like. I only wish that it were a bit smaller so that I could more easily fit it in my pocket. A pouch that you could clip to your belt might be a nice add. 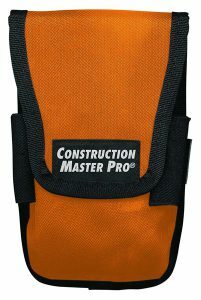 I have the other Construction Master calculator and this one is easier to use with prompts and has more features. This calculator does all that's claimed and does it well. The calculation methodology is intuitive and so far I've only found one useful function I enjoyed on my previous construction calc absent on this one; the ability to convert decimal entries to fractional values. It performs the reverse conversion but for some reason not this one. The included case provides good protection and a handy spot for a crib sheet, but increases overall size substantially. A big negative, and potential deal killer, is a non-backlit LCD display. The display panel appears adequately large at first but because its configured for up to four rows of characters the font size is small. This combined with no backlighting makes it worthless in both poorly lit and brightly lit areas. Basements, crawl spaces, garages, evening, sunny days will create frustration. At $75 a backlit display should be a standard feature. I love this calculator! What a time saver while both estimating and on-the-job applications. I originally purchased the model below this one and found it difficult to have to pull out the user manual to input each variable for calculations. I returned it as soon as I saw this one was available. It automatically prompts you for each variable in the calculations. It just makes sense. I have an app on my iPhone that does a lot of what this does, however I find this rugged and able to be stuffed into my tool pouch for quick calculations, not worrying that Im going to destroy it. All-in-all its pricier than the ones found in big box stores, but it does a LOT more than the simple math. For the accuracy on the job site, you can't beat having the right math the first time. Well done, calculated industries! This is a replacement for a Calculated Industries unit I have used for over Twenty years. I got the most advanced model I could find knowing that it would last a long time and that I would learn to use the new features as I needed them. These are the very best for construction math. My old one walked off and disappeared. I hope the new user finds it okay too! The hard shell of the new models are a great feature for protection in the field.